AD-21/3512 is a wideband low-profile monopole antenna covering 30-512 MHz for mobile comms and jamming up to 50 W CW. The antenna can be affixed to vehicles by magmount or permanently mounted with a bulkhead mating connector. 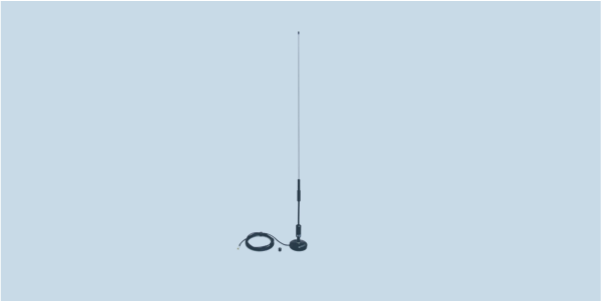 AD-21/3512 is a wideband low-profile monopole antenna covering frequency range from 30 to 512 MHz and is intended for use with portable and mobile radios. The antenna radiator is composed of two parts: the whip made of special strong and flexible stainless steel with spring at the bottom and the matching transformer unit above an N male coaxial connector. The radiator and the matching unit are painted with UV protective polyurethane black paint. The antenna radiator could be used as a separate antenna attached to the portable radio device or it can be used with the magnet base ADM-21/N or fixed base ADN-21/N, both with the integrated coaxial cable length of 4 meters and ended with the FME female connector. Various adapters from FME to N, BNC, UHF, SMA, etc. are available on request.